I've been thinking a lot lately of how I want my future kitchen and living room to look. I've been trying to stop myself from buying anything new until were ready for our major kitchen renovations. Currently, our kitchen is closed off to the living room, but when the time comes to do the kitchen we'll be removing two other interior walls to open up the floor plan. My plan is to move the living room furniture to the basement and get all new furniture for our living room. I'll keep some of the existing accent furniture, but will add in a few more pieces as well as new decorative accents. 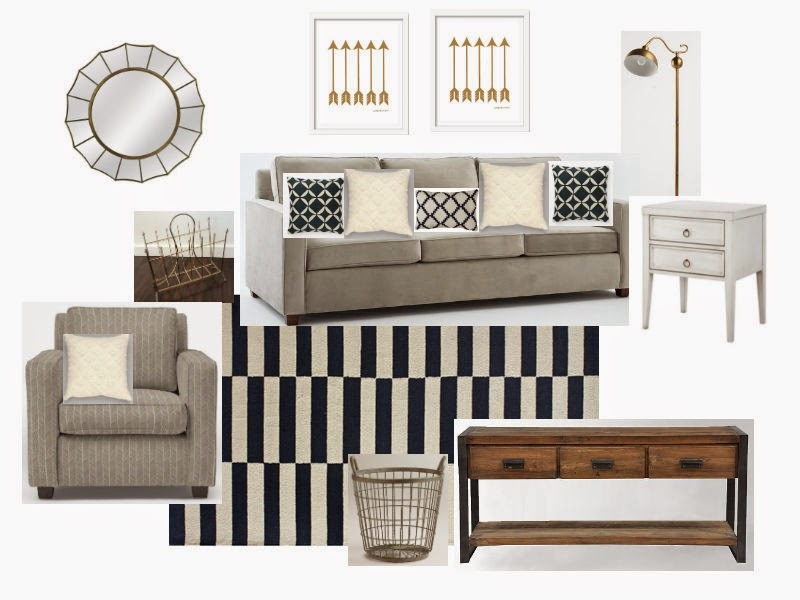 I have been crushing on navy blue lately and love the idea of a more neutral living space. Rugs USA Homespun Block Navy rug. West Elm Henry Adams chairs. Love love love this! LOVE the arrow prints!